Support a local farmer and see where your food comes from. Hedgebrook Farm circa 1906 has been educating the community for over 30 years. We offer an educational experience on a real working dairy farm. Our farm is Animal Welfare Approved and also practices a number of environmentally safe farming practices. The field trip will cover various SOL skills, plus it is a lot of fun! If you have a specific skill you are trying to support please let us know. One of our team members is a former elementary teacher so she can assist you with your planning. NEW THIS YEAR: Hydroponic farming system. We are growing lettuces and other greens using fertilizer from the fish living in the water. We offer two fieldtrip options this year. You will experience a real working farm. On the tour, you will learn about a number of animals, their characteristics, and how they supply a product to the consumer. Visit the dairy barn and see where the jersey cows are milked while learning about dairy products and how they help your body. Walk around the farm visiting the sheep, dairy calves, pigs, ducks, and turkeys. The strawride is a favorite. You will see the entire farm operation and the beautiful views of the mountains. Pumpkin patch. Pick your own pumpkin here to take home. Visit the hydroponics farming system and hear about other environmentally safe farming practices while you visit the animals. The strawride is a favorite. Here you will see the entire farm operation and the beautiful views of the mountains. Pumpkin patch. Pick your own pumpkin to take home. 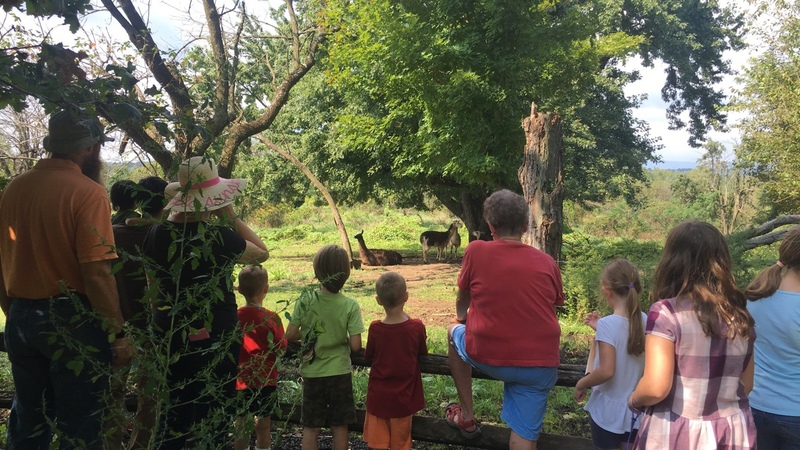 The farm is a country gathering place where you can enjoy the natural surroundings, view farm animals from every location even while you eat your picnic lunch. Payment is due in full upon arrival; please make checks payable to Hedgebrook Farm. Tour time: 2 to 2 1/2 hours depending on the size of the group. Park in the marked parking area near the APPLE. A member of our team will greet you, take a headcount, and receive your payment. If yes please bring trash bags for your trash and be prepared to take your trash back to school...farm animals do not eat people food. Headcount: This is a roughhead count to help us plan accordingly. The Hedgebrook farm family looks forward to seeing you and sharing our love for agriculture. We appreciate your business and thank you for supporting a local farmer!